Hema during felicitation function at Bombay Gymkhana for winning bronze medal at Asian Games in mixed team event. They were part of the Asian Games Indian contingent and came back with medals. But at the Games Village in Indonesia many regarded them as coaches or support staff due to their age. They belonged to a less known sport - Bridge which was introduced for the first time in Asian Games but these athletes may have bridged the gap as the sport won India a gold and two bronze medals. 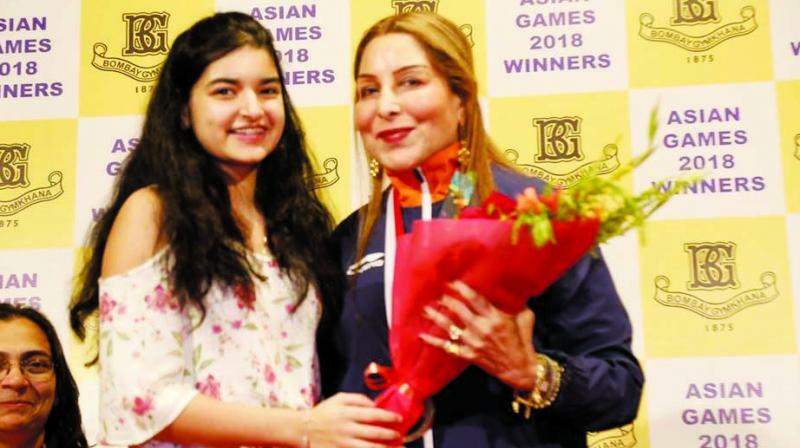 “Many at the Asian Games thought we were coaches or with any team,” informed Himani Khandelwal who was felicitated in a ceremony at Bombay Gymkhana along with her husband Rajeev Khandelwal and Hema Deora, wife of former union minister, late Murli Deora, for clinching a bronze medal in the mixed team event. All the three Mumbai players teamed up with Kiran Nadar, Bachiraju Satyanarayana and Gopinath Manna to earn laurels for India in Indonesia. The Indian team of Pranab Bhardan and Shibhnath Sarkar had clinched the gold. The mumbai Bridge players believe people will become more aware about the sport. “We were confident to comeback with a medal but we missed silver closely. Nevertheless our contingent won one gold and two bronze. It has generated awareness that it is not gambling sport but mind sport like chess. We need help from government for better progress,” Hema told us at the sidelines of the function. The 67-year-old picked sport from her late husband and started participating in events. “I was busy with family and my profession architecture where I used to do interior designing. I knew about construction bridges only. But as my children grew up I used to watch my husband play and gradually developed interest in the game. I started playing at club level,” she added. Hema started with club level tournaments in Mumbai and went onto play national and international tournaments. “Maharashtra and Kolkata (West Bengal) are much stronger than other states in the sport,” she said. She admitted the Asian Games medal-winning feat has brought instant recognition to them. “I represented India more than 10 times before Asian Games. But this was the first time when government stepped in and sent our team to Asian Games where the game was introduced for the first time. We have won so many trophies before but this has been recognised,” she added. Emphasising the game is much like chess, Hema informed it requires more mental strength but they have to stay physically fit also to maintain focus and concentration.